Posted: Tue Sep 15, 2015 3:15 pm Post subject: A question about Performance Tyres? Ask the Michelin Expert! 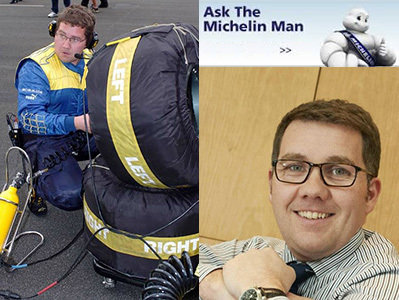 For the next month SEPTEMBER 2015 through to the end of OCTOBER 2015 , Michelin have agreed to return to be available to answer any question that you might have on Tyres. FYI the previous Ask the expert series from April 2014, can be found here. Funnily enough, just ordered 2 rear N3 Pilot Sports for my C4S to replace some PZeros which had become very noisy. Not had them before, so will be interested to see how they get on but was advised by the Porsche indy that they were a better bet. I've just had the geo done, plus new suspension bits. Presumably it'll be OK to mix them til then? Thanks Michelin for coming back ! So I'll add this question. High street tyres garages promote nitrogen filling for tyres, does this have any benefit for Porsche Performance Tyres ? However, suffice to the Michelin's being the appropriate "N" fitment, it's perfectly normal and understandable to mix them as long as they are in axle sets. The uneven wear of rear tyres on a 911 seems to be a fact of life which means that many people keep them on until the inside edge is only just legal (or beyond). Are there any issues associated with that part of the tyre being run so low on tread? The big benefit with Nitrogen over normal compressed air is it tends to be drier. When Michelin did F1, we used ultra dry air. Thanks for the feedback- I will be switching the fronts to PSs once the dust has settled. I had a full 4 wheel geo done, inc camber, and as a result a few suspension bits were replaced. Some wear on the inside is inevitable as 996 4Ss seem to have quite pronounced rear camber, but the current tyres have not so much worn on the inside as pulled the tread blocks up at the leading edge, giving them a stepped/serrated feel if you run your hands over the inside edge. This makes for a very peculiar road noise, almost like driving over a lightly ridged surface, which in effect it is. The technician reported that the geo was well out, particularly the rear camber. Hopefully the geo and new parts will make for a longer and happier life for the Michelins! Any chance of getting my M4 up a steep hill in the snow with Winter tyres on? When are you releasing a new tyre for the 996 GT3. Had to go out the 'box' and went with PSS's in slightly to bigger size this time round. If you look on the door shut, there will be a tyre pressure sticker, showing what the appropriate winter/m&s fitment is. If there is one approved, then BMW M will have tested the car in proper winter conditions. Is there an "expiry date" on tyres ? So if you follow these guidelines you'll be fine. Many thanks for your response..
Really enjoying this thread and thanks in advance of any help. I’m running Pirelli P-Zero’s on my 2003 C4S Cabriolet – I’ll probably be looking to have to replace these in the New Year as I use my car as my daily drive. I don’t drive fast; I do a lot of motorway cruising at around 75-90. If I wanted a set of tyres that would give the most comfortable and quietest (road noise) ride, what would you recommend. We still make (and are in agreement with Porsche) PilotSport PS2 "N" rated for the car in the OE size. Pilot Super Sport will continue in the size you have fitted. Until we get approval on the Pilot Sport 4 range for 911's we won't be able to change anything onto the new tyre on older models. It's in hand.. testing is in progress as we speak, but that's where we are at present.. very much status quo.. It depends on where you are with warranty and Porsche..